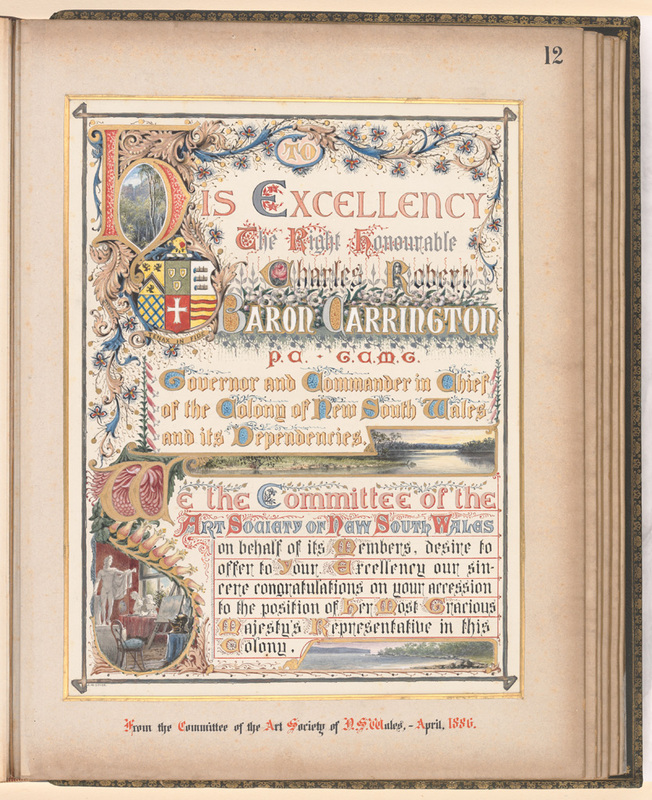 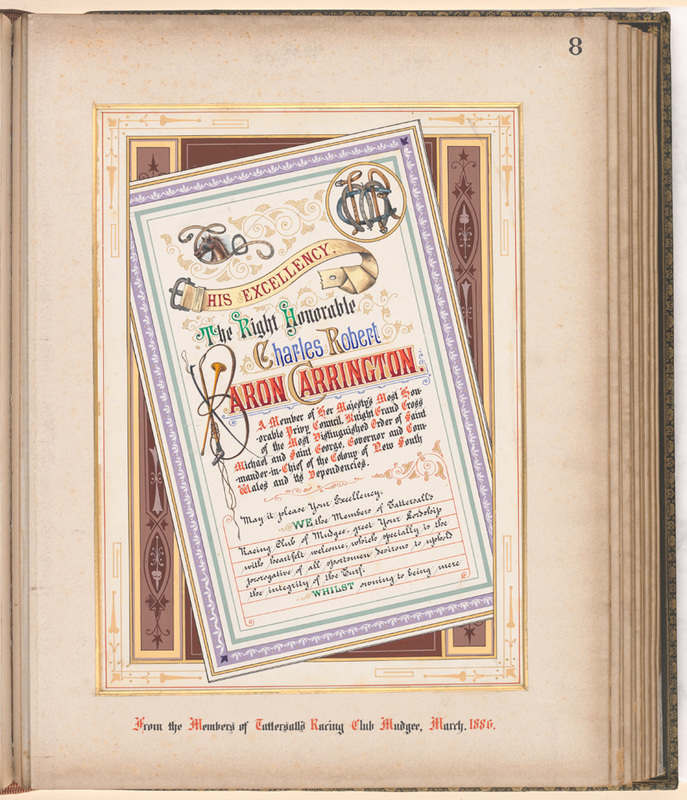 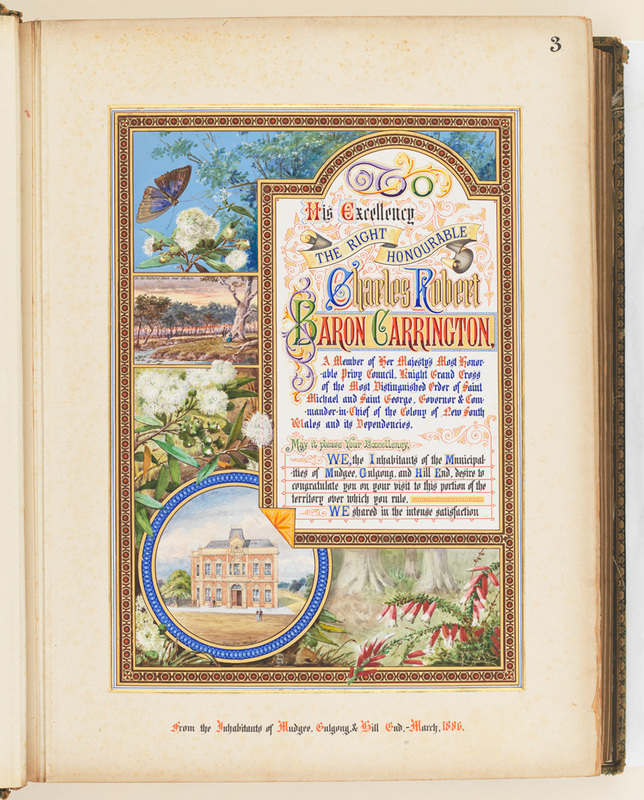 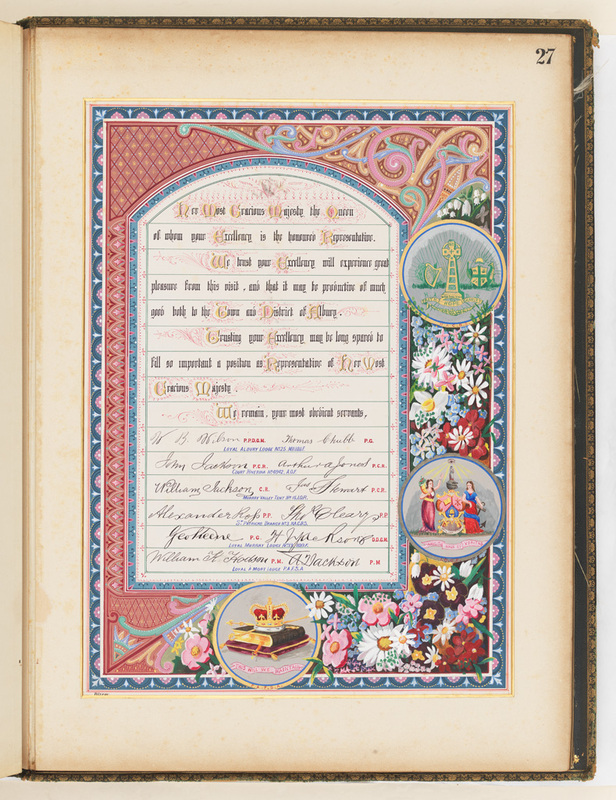 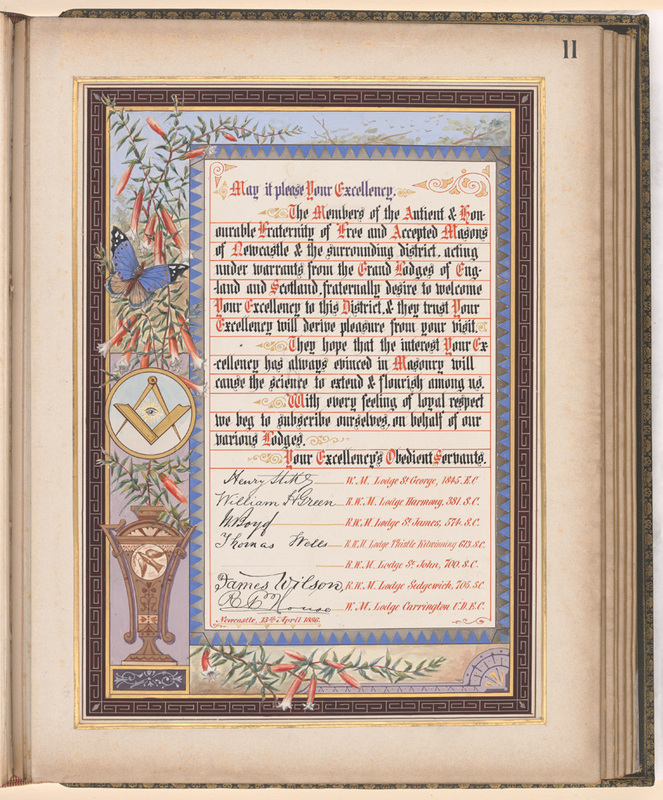 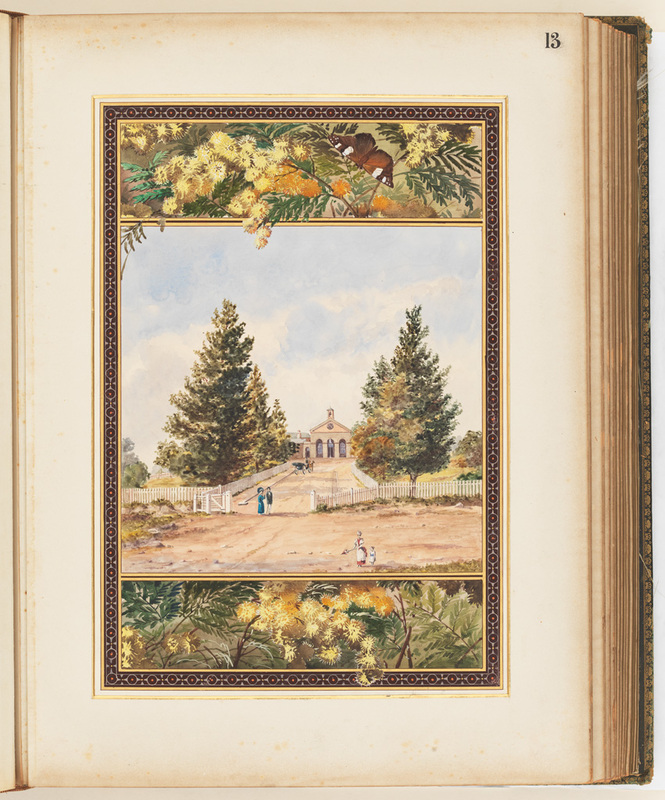 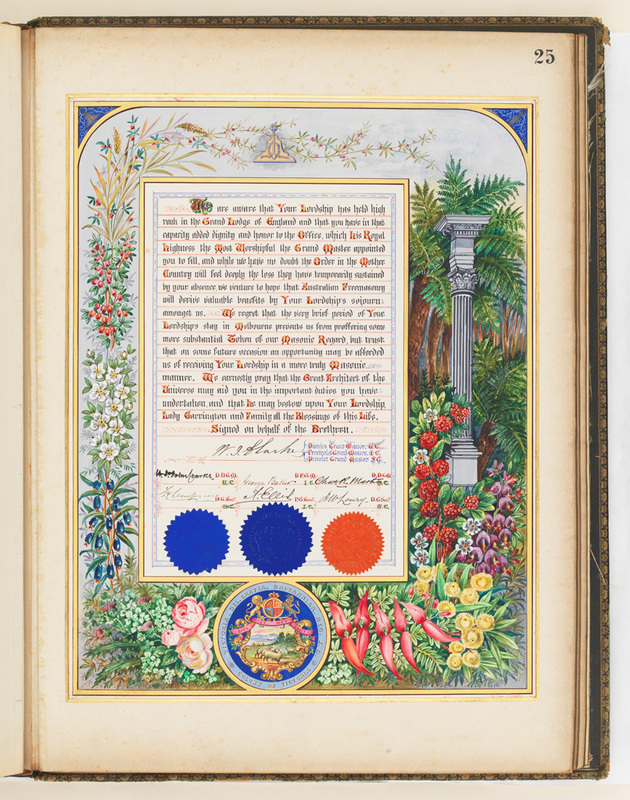 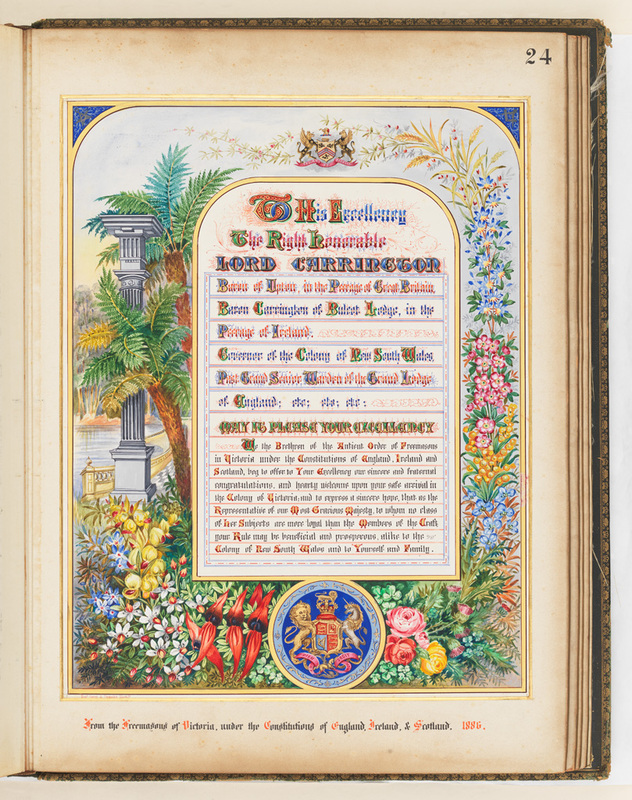 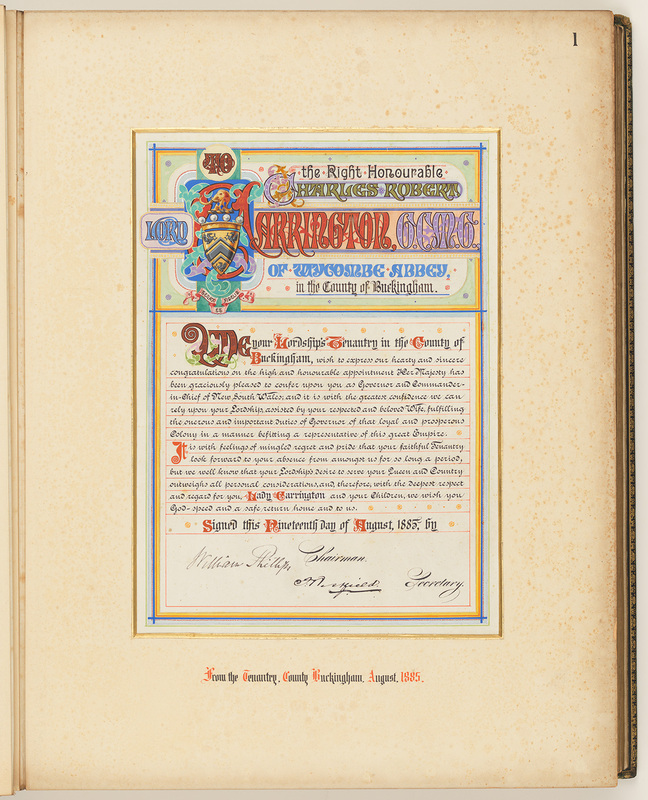 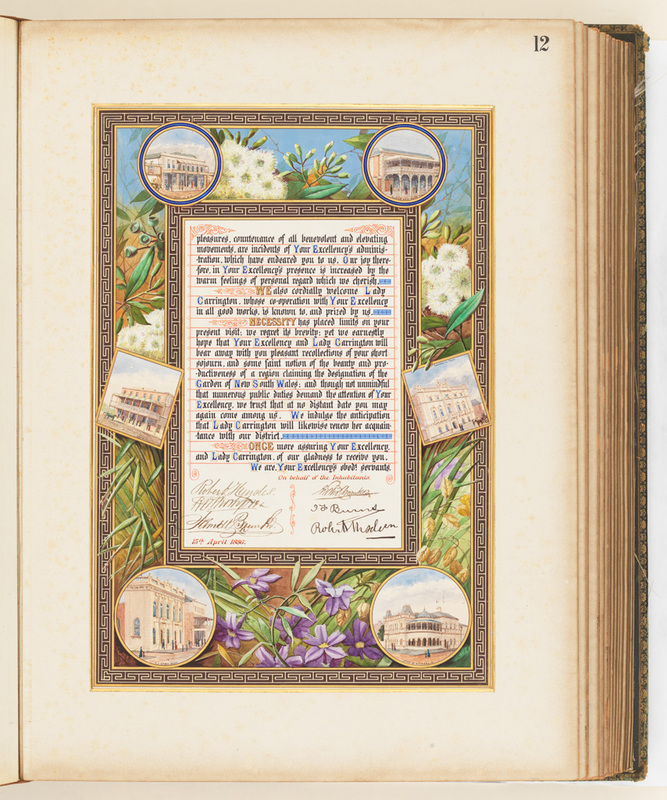 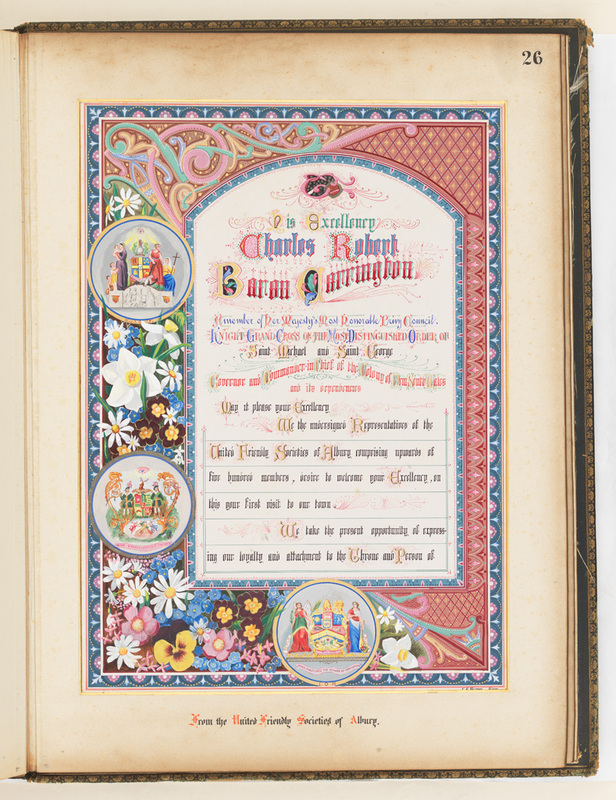 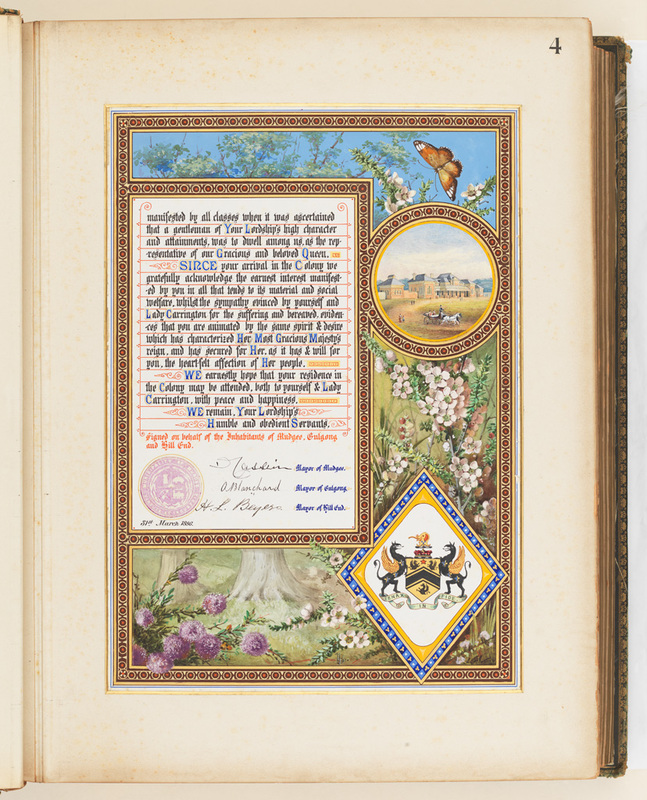 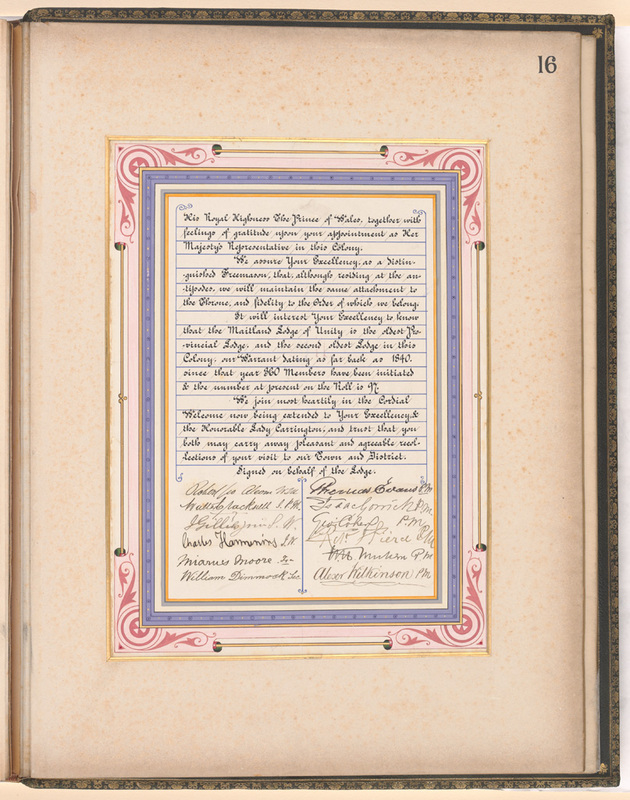 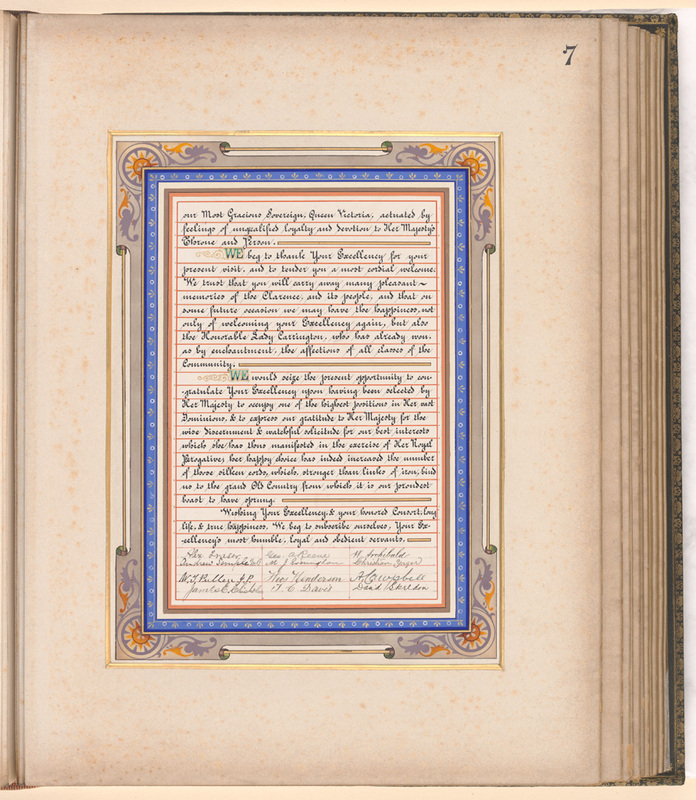 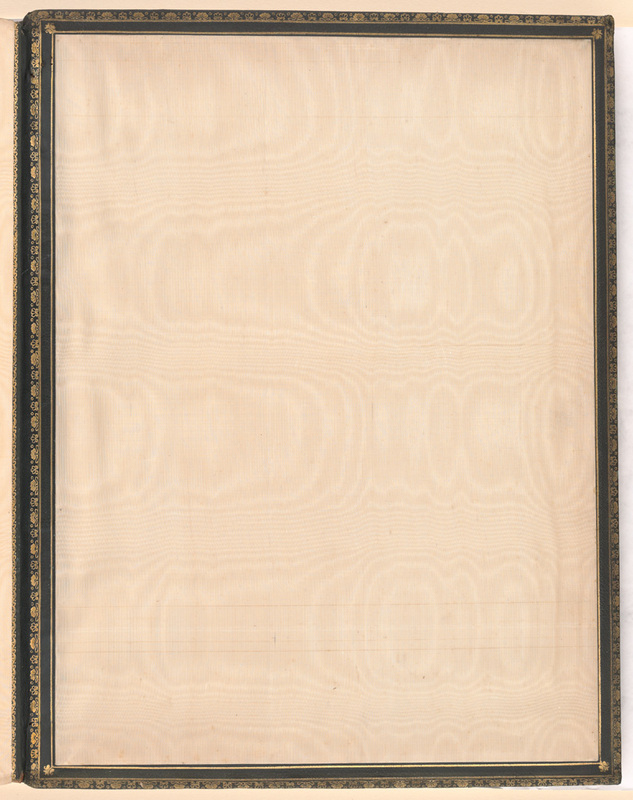 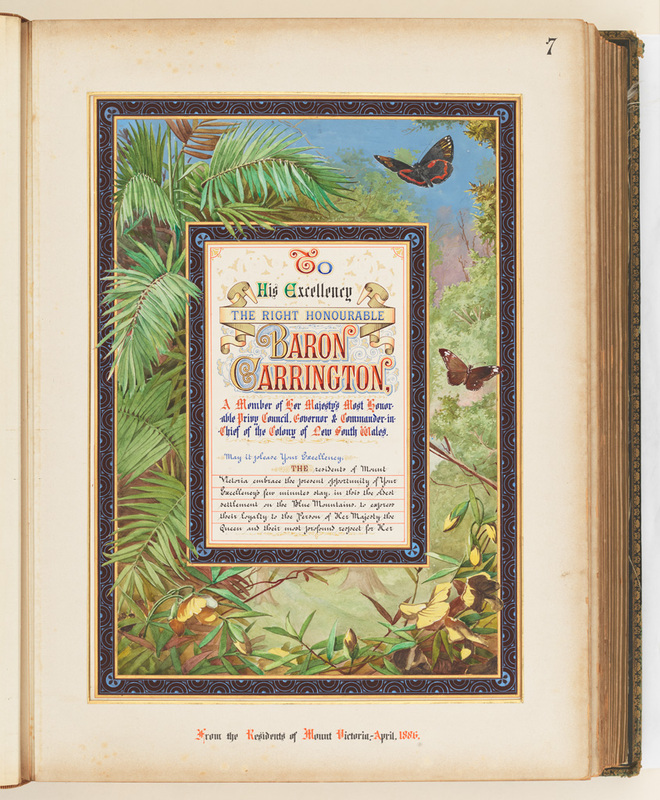 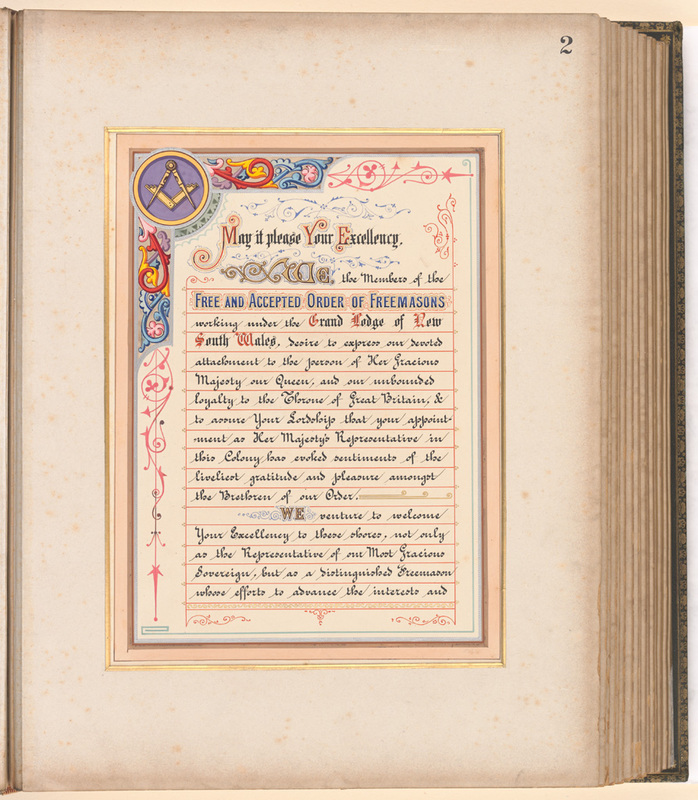 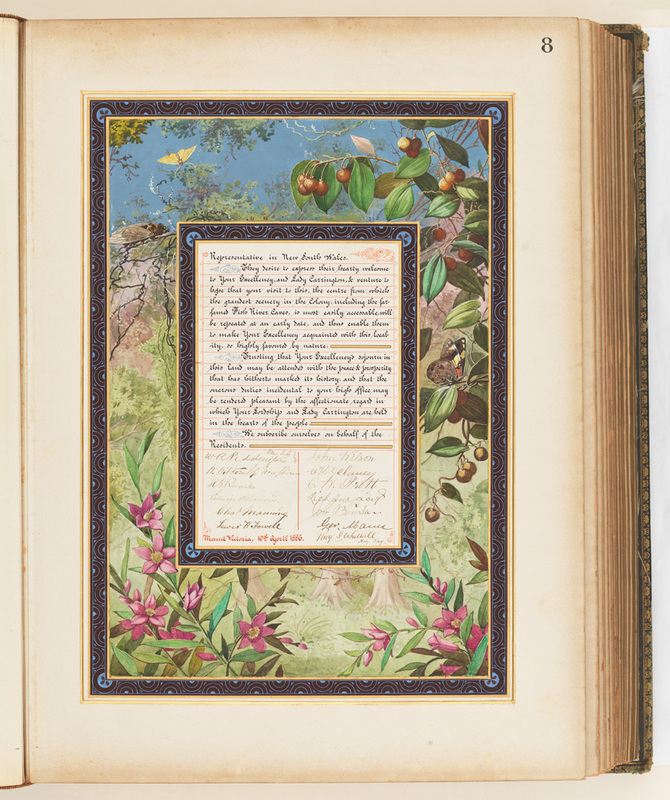 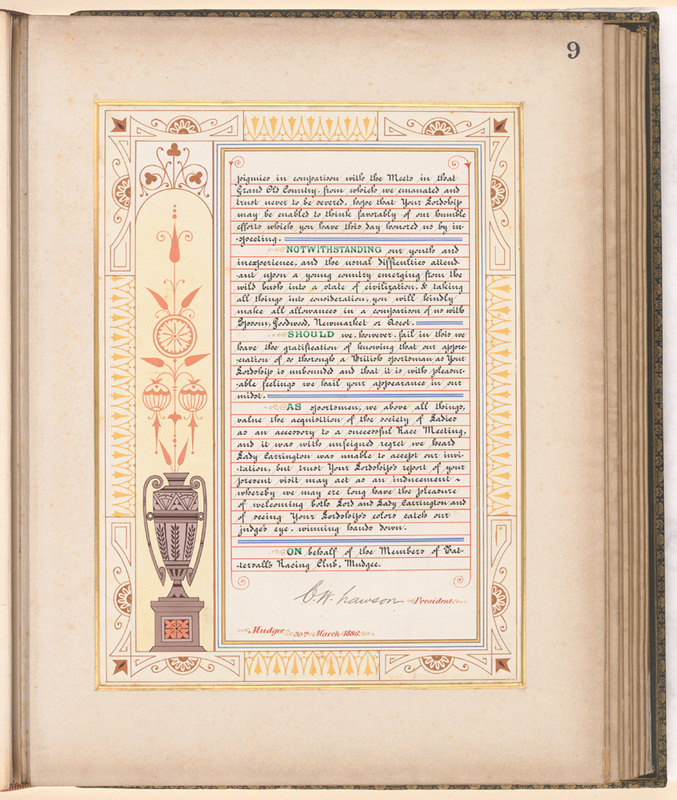 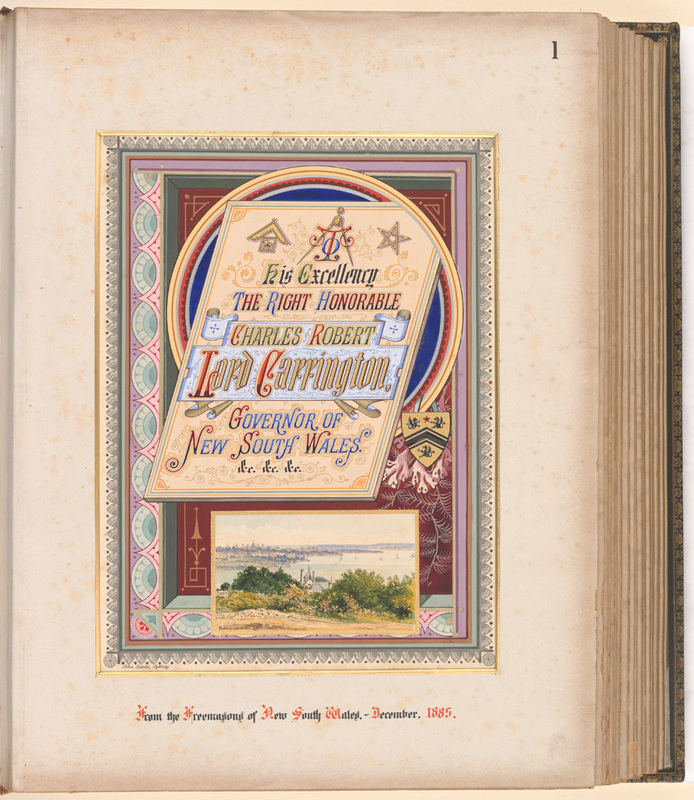 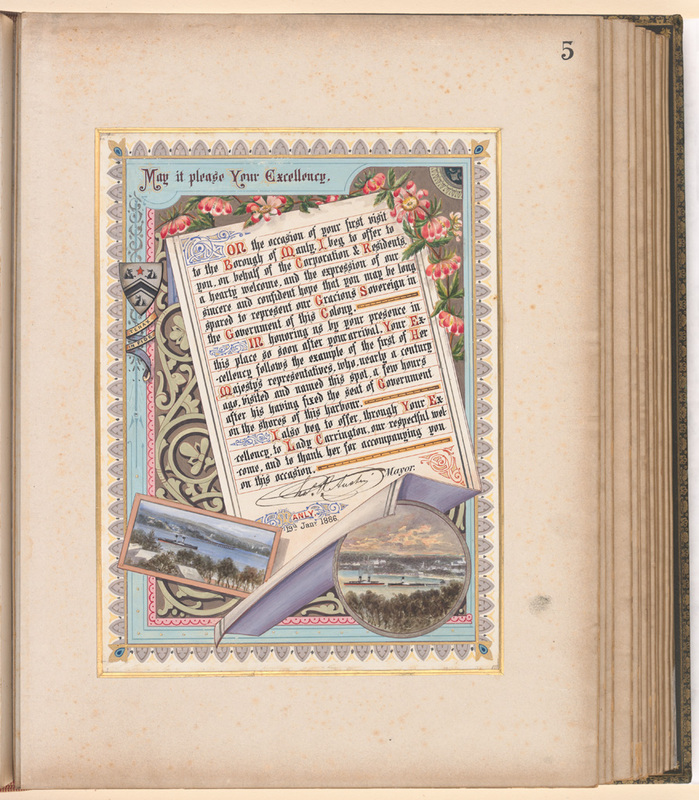 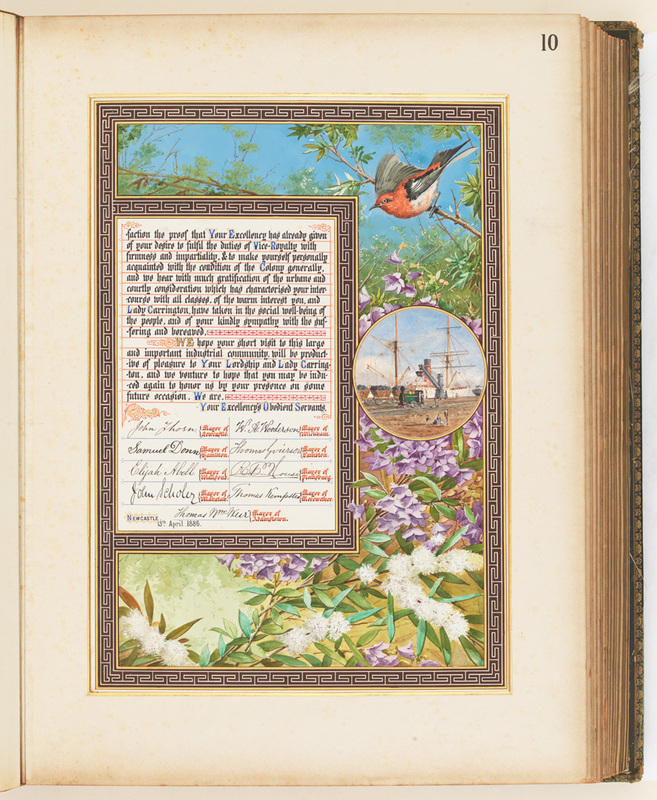 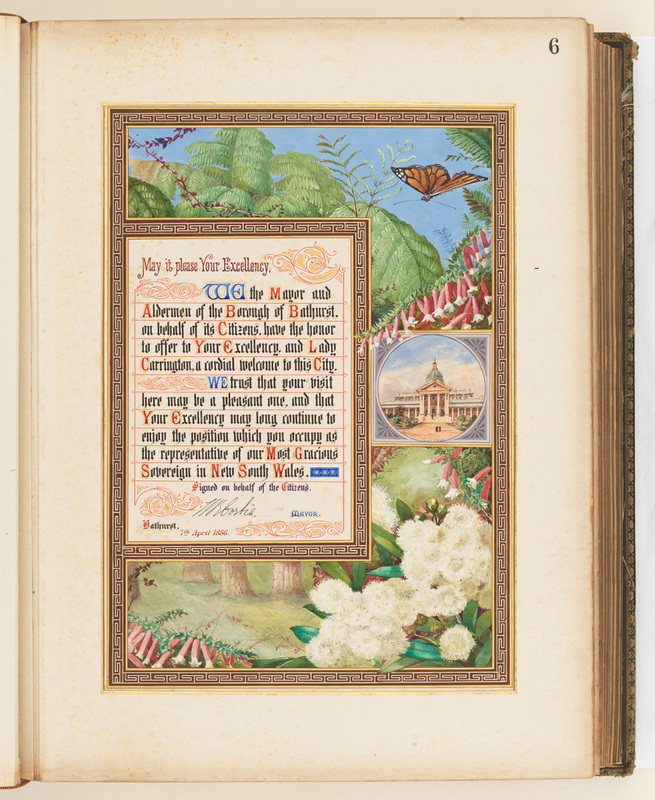 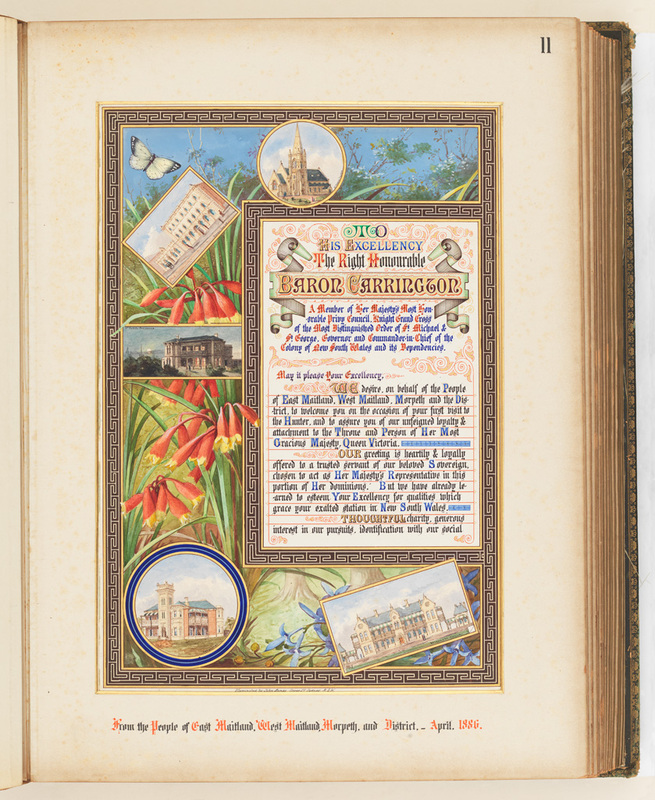 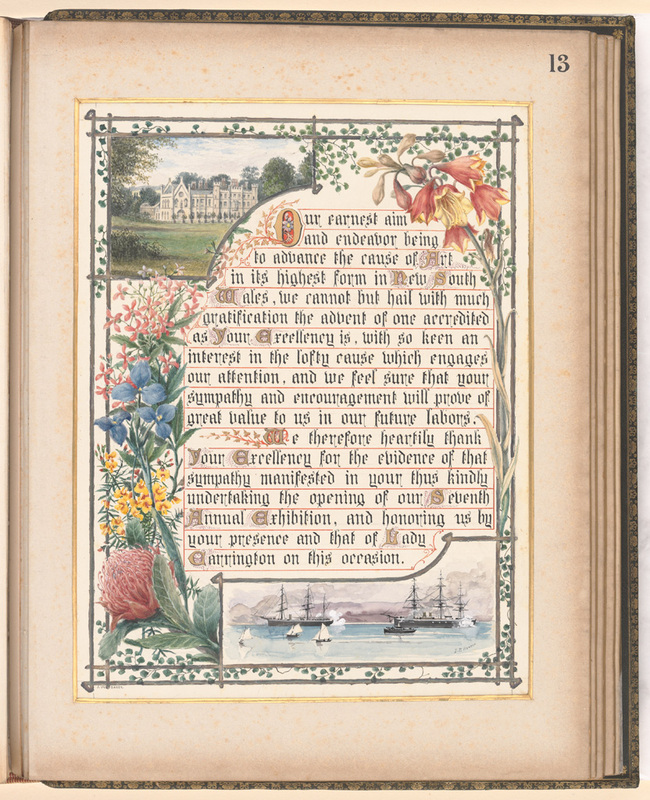 This series of albums contain illuminated addresses that were presented to Lord Carrington as Governor of New South Wales between 1885 and 1890. 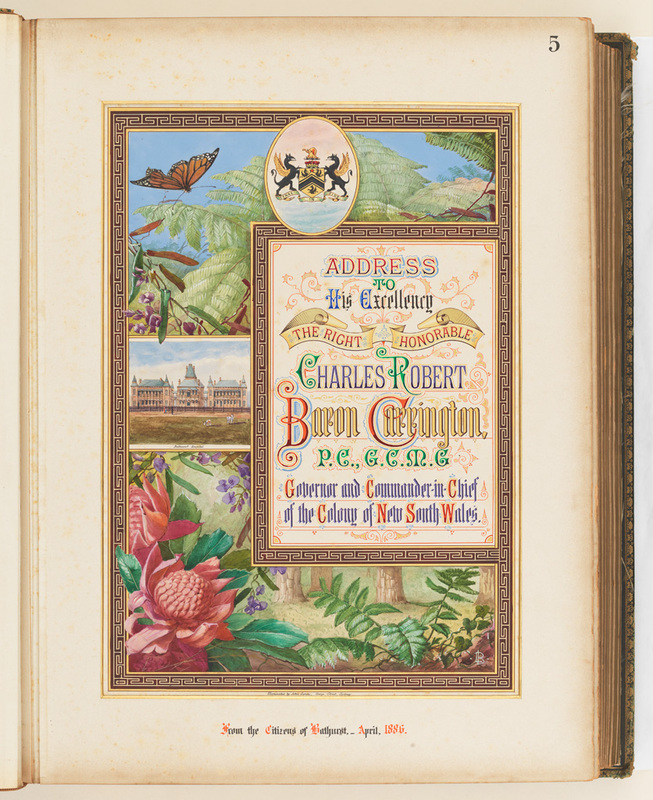 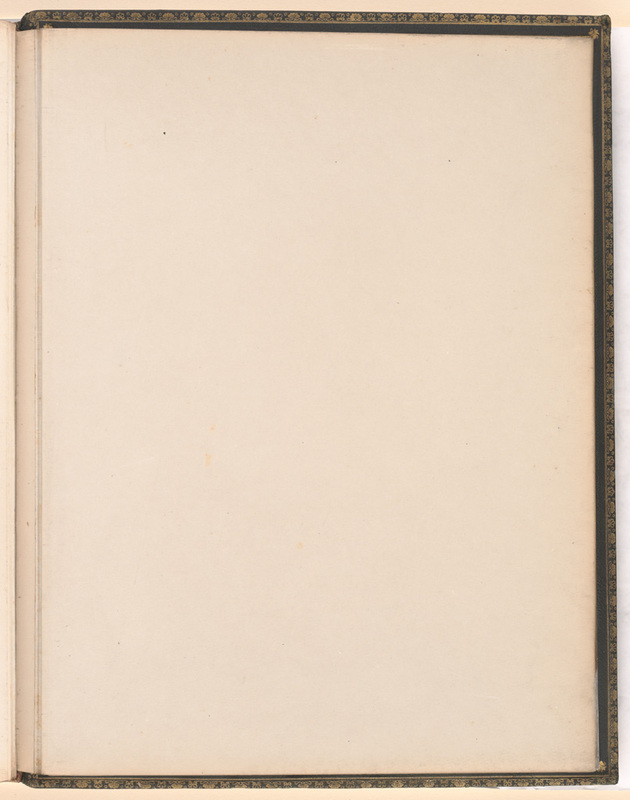 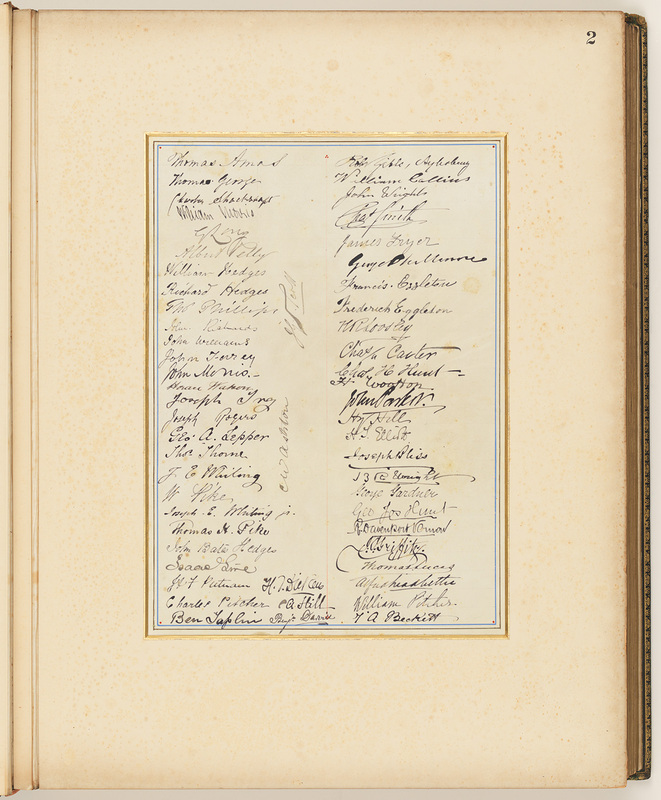 The volumes are numbered numerically with the following inscription on the cover and spine of the volumes: 'Addresses presented to Lord Carrington Governor of New South Wales'. 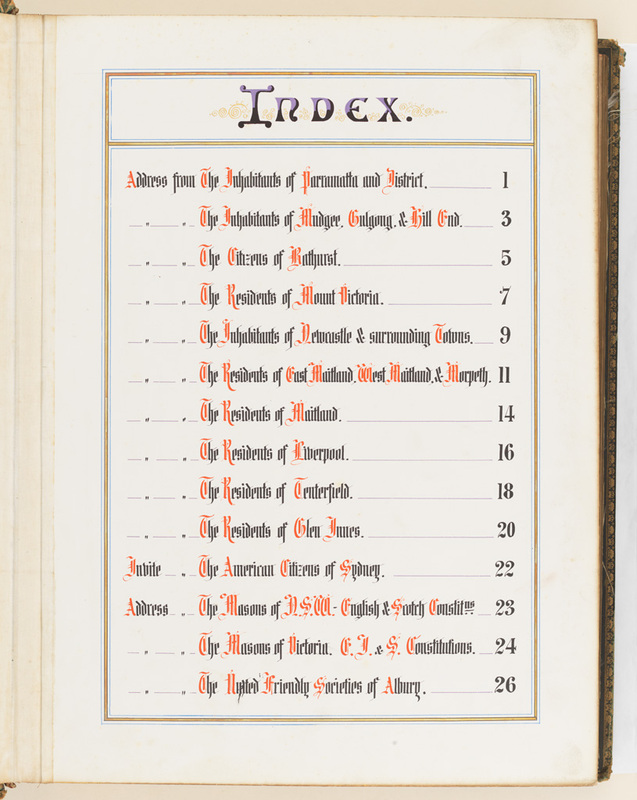 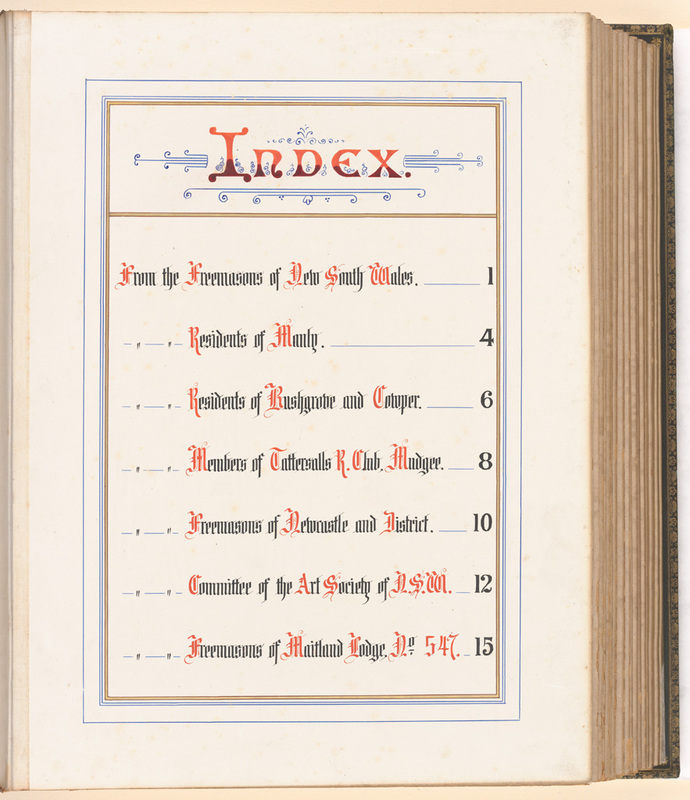 Each volume contains an index at the front of the album recording who an address was from and the page number. 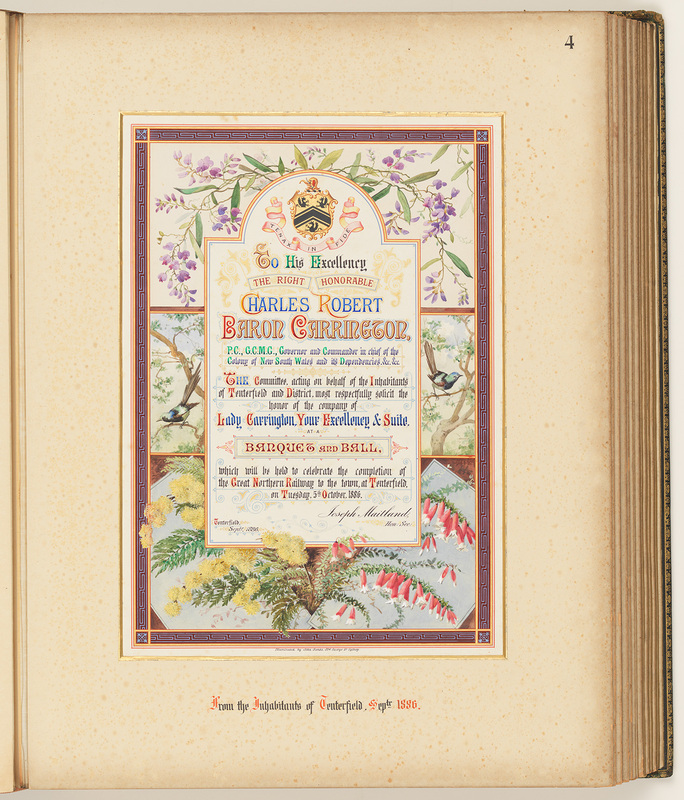 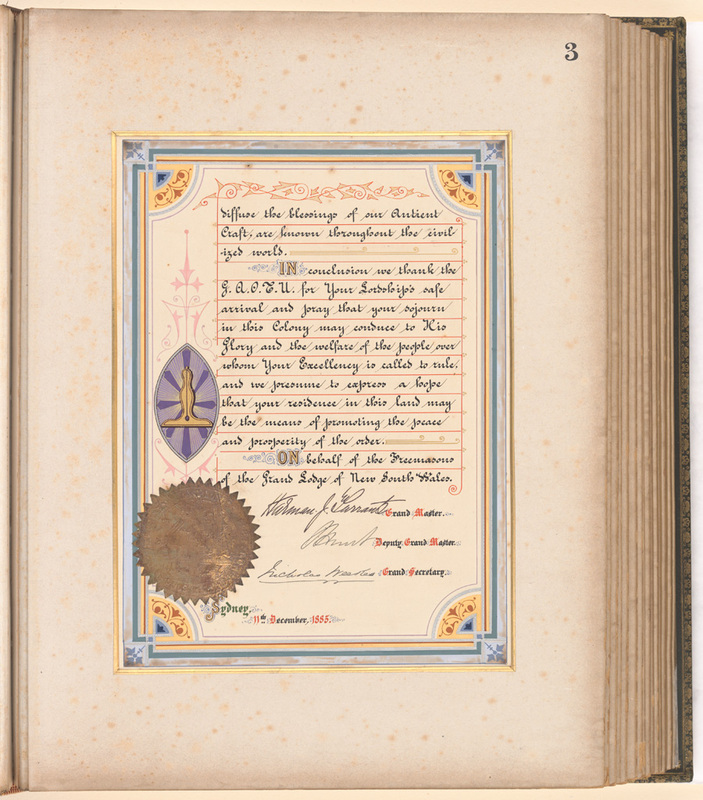 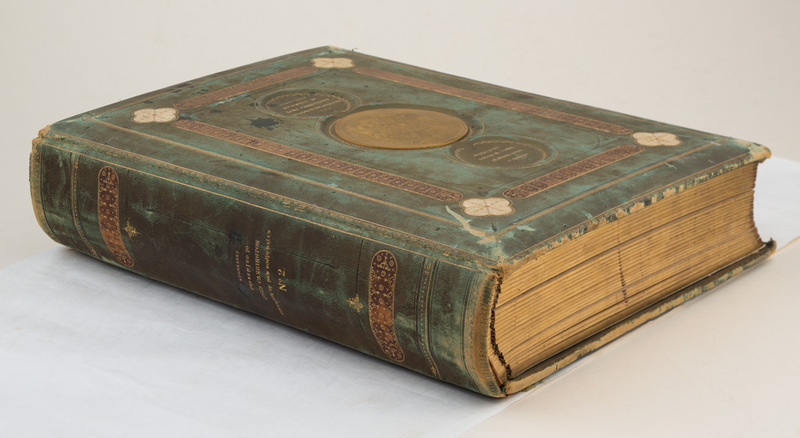 All the albums feature a tooled leather binding, gilt-edged pages, and cloth-hinged leaves. 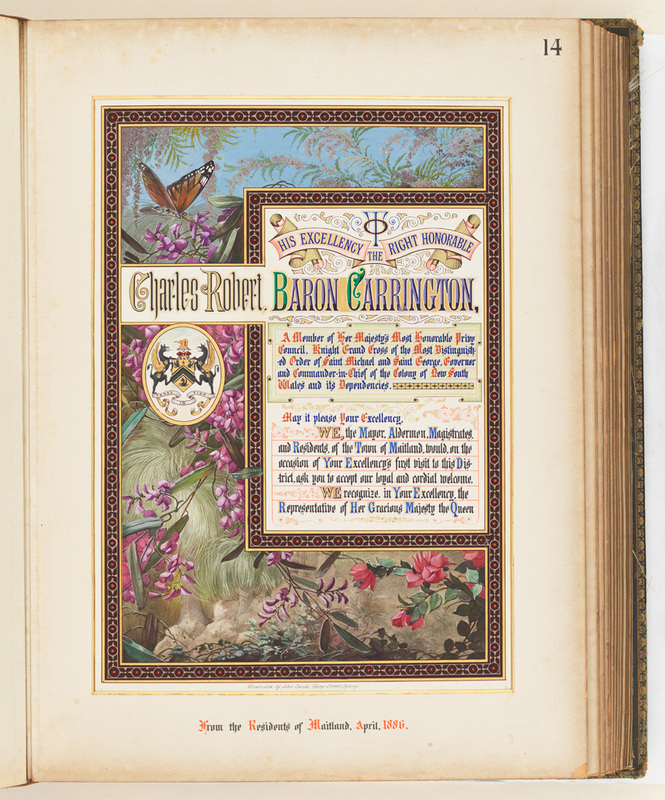 The albums all contain the same decorative patterns on the cover and spine. 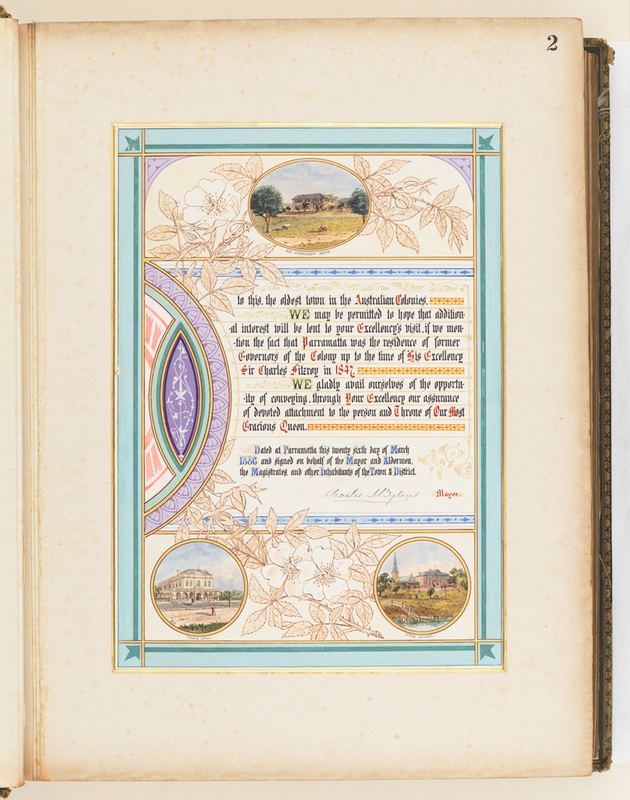 Volume number 1 is smaller in size, the albums dimensions are 410mm x 320mm x 65mm. 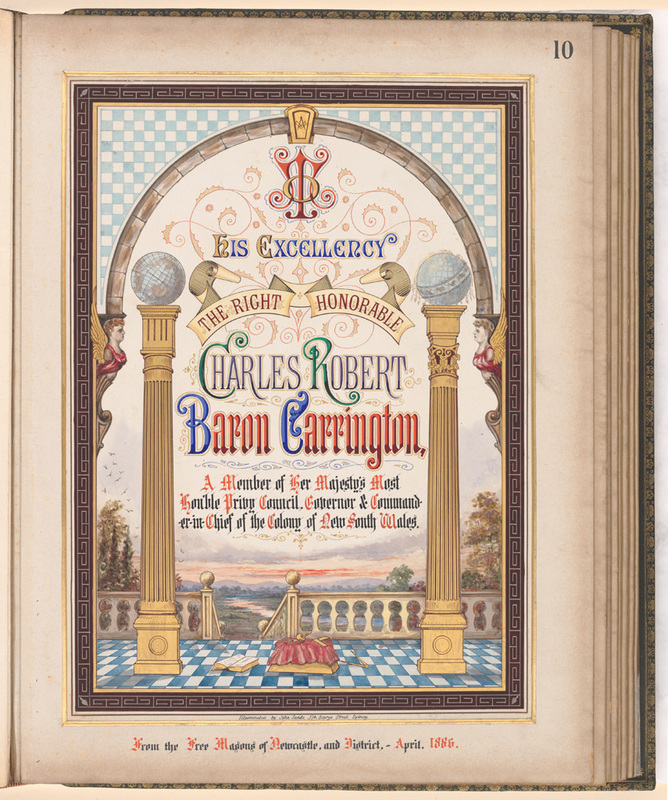 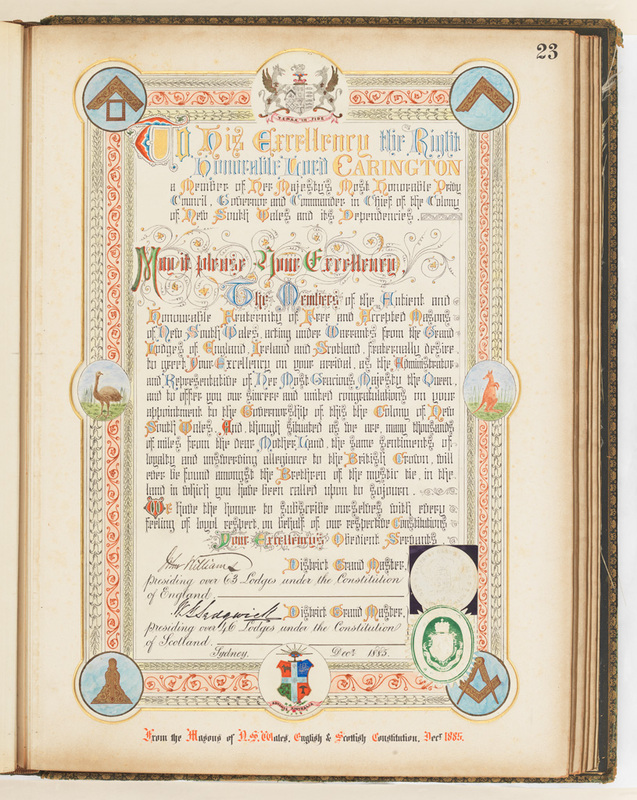 The cover contains an engraved rectangular brass plate depicting the Carrington family crest and motto 'Tenax in Fide' (Steadfast in Faith). 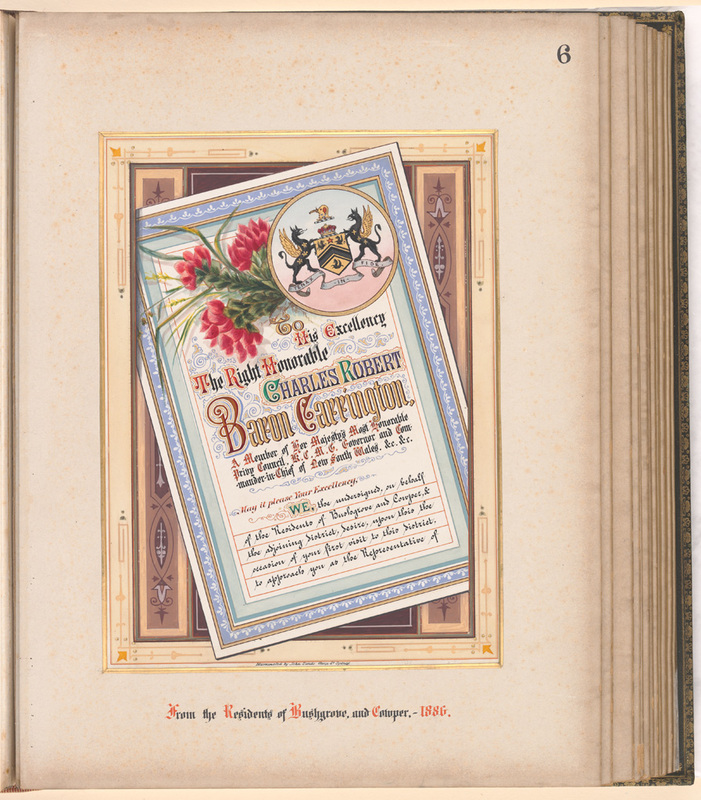 The brass plate has the name H.G. 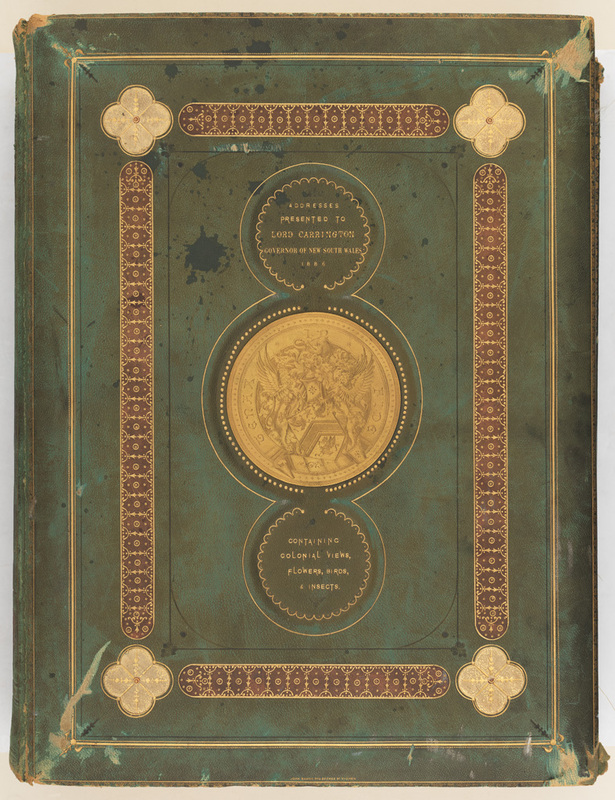 Sturges engraved at the bottom. 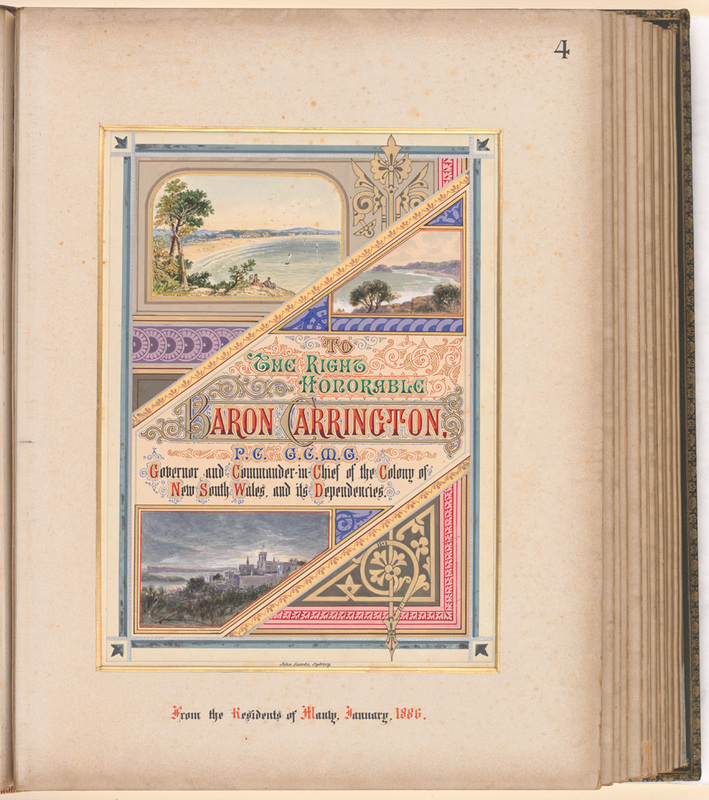 The first volume also contains the gilt inscription 'John Sands 374 George St. Sydney' and the year '1886'. 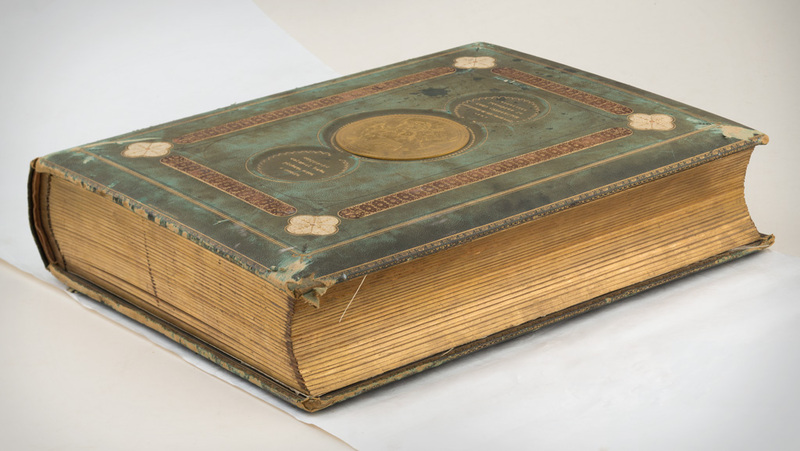 Volume number 2 is also smaller in size, the dimensions are 525mm x 390mm x 115mm. 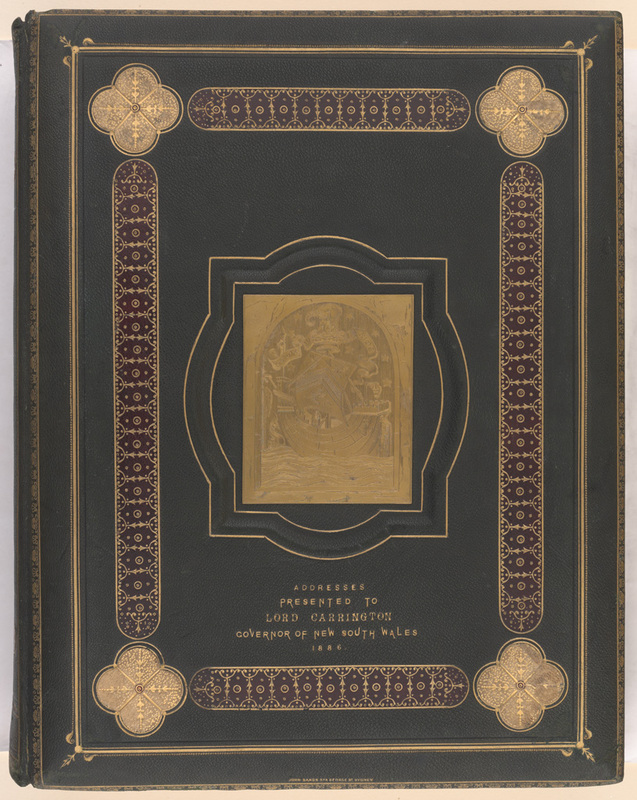 The cover contains an engraved circular brass plate depicting the Carrington family crest and motto 'Tenax in Fide' (Steadfast in Faith). 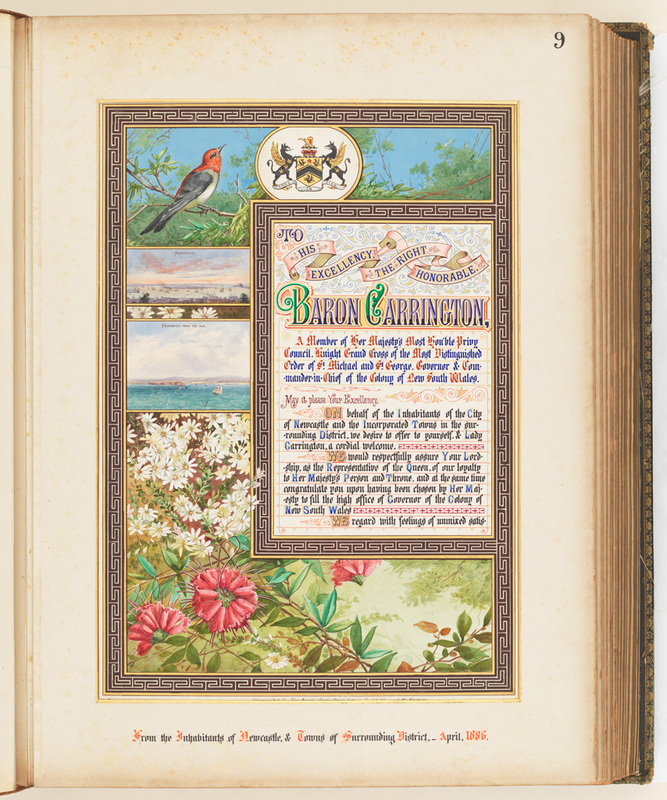 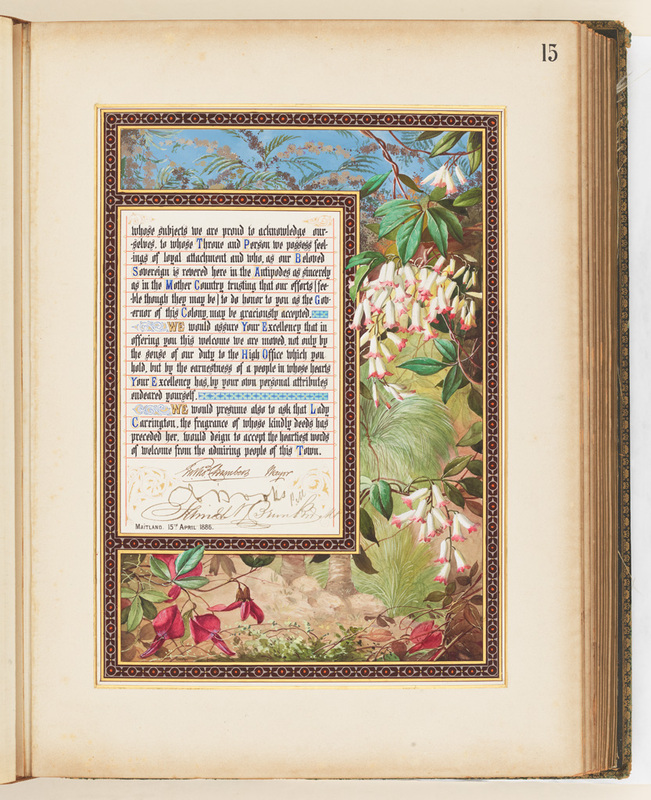 The second volume also contains the gilt inscription 'Containing Colonial views, flowers, birds & insects' and the year '1886'. 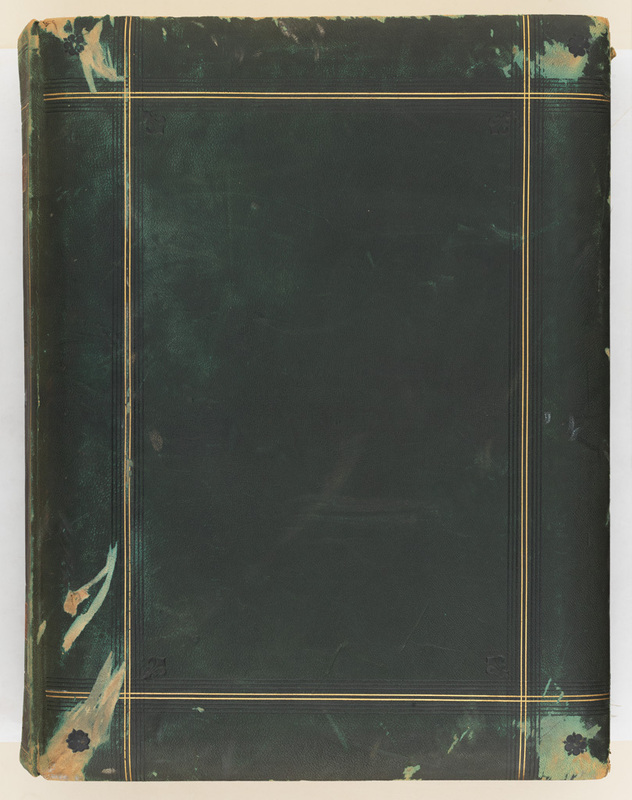 Volume number 5 contains a brass lock on the side of the volume. 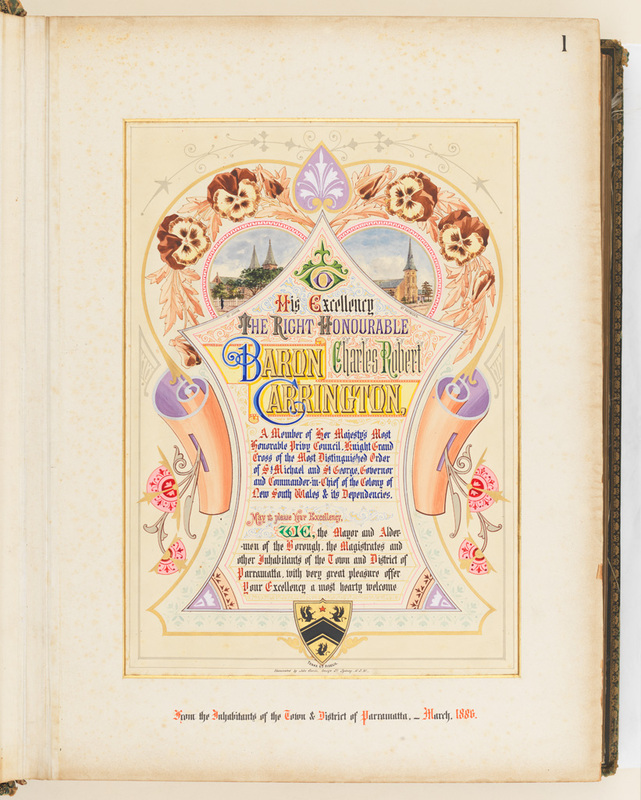 The lock has the engraved name 'Bramar London' on the top of the lock. 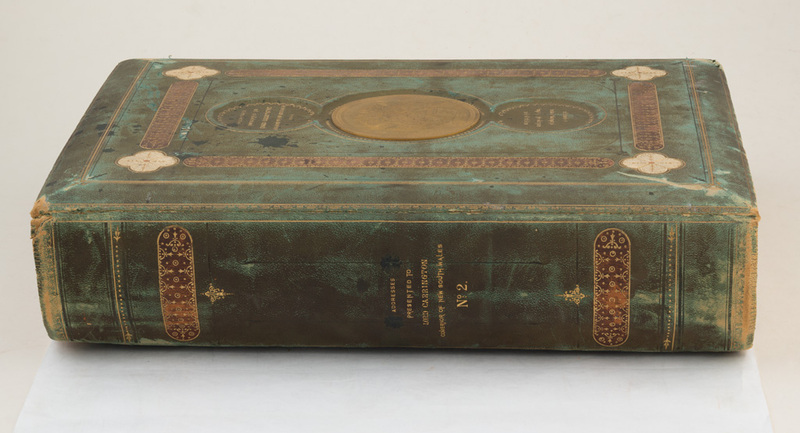 Volume 11 was not received by State Records. 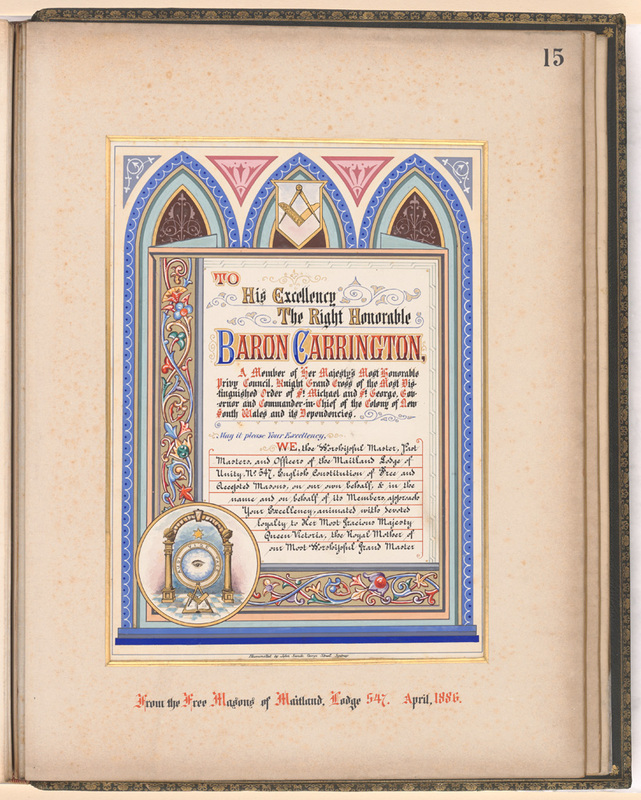 Digital copies of 3 volumes are available through Archives Investigator. 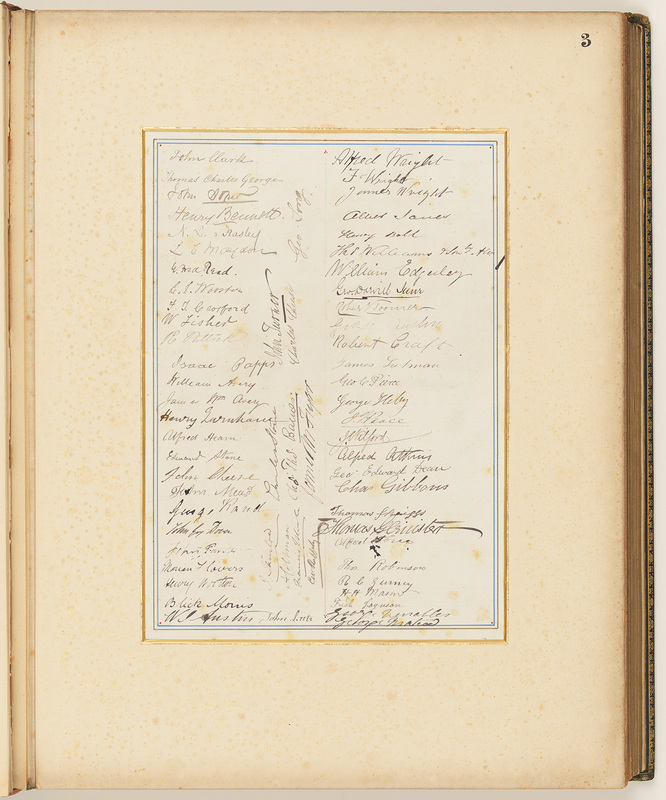 Items lists are available electronically.